At Hastings Veterinary Clinic, we specialize in allergy treatment and dermatology problems and have the expertise to diagnose and treat whatever is troubling your cat. If he or she is suffering from an allergy or a dermatological irritation, special cat care is needed and can be provided at our veterinary allergy and dermatology clinic. The problems can range from skin/ear itching or inflammation to hair loss or recurring infections. No matter what the source of the difficulty, underlying diseases that cause your cat to develop a skin or ear disorder must be diagnosed and treated before they create a serious health problem. Itching is the most common sign of allergic reaction in a cat. You’ll know your cat has a troublesome itch when you see him/her scratch or bite her skin, pull out his/her hair, or perform constant grooming. If parasites are not the cause of the problem, it is likely to be allergens. It is possible for these reactions to be caused by boredom or anxiety but this is uncommon—it is always safest to have your cat checked by our animal doctors if you see such unusual behaviour. Allergies in cats can result in skin and ear problems or gastrointestinal trouble. Food allergies (e.g., fish) are suspected if the symptoms are year-round and may or may not be accompanied by vomiting or loose stools. Environmental allergies can be seasonal, and can be caused by indoor or outdoor allergens. Such allergens include pollen, dust mites, storage mites, mold, and household dust. All of these can cause itching and hair loss, and can lead to infections. Flea bites can cause more itching and infection in allergic cats and dogs than for those not allergic. Topical or oral flea prevention is a must. 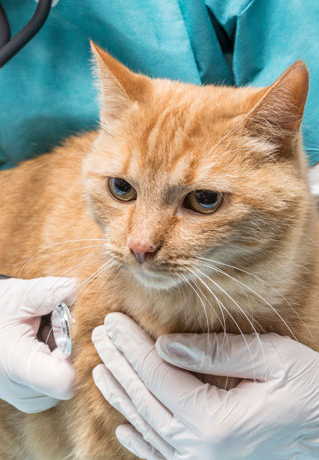 Aside from allergies, your cat can be troubled by parasites. Severe itching can also be caused by bacterial infections. A cat may constantly lick an area that hurts rather than itches. For example, cats may lick arthritic legs or the lower abdomen because of a problem under the skin. Any chronic or acute itchiness, regardless of body part, is abnormal and must be assessed by a veterinarian. There is no cure for allergies, but they can be controlled once identified. Dermatological problems might take longer to diagnose and, as cats respond differently to medications, several visits might be needed to find the best treatment plan. For environmental allergies –These are best diagnosed with intradermal skin tests which can identify the correct source of the reaction. Dermatological testing and diagnosis can be pursued at Hastings Veterinary Clinic. We have access to state-of-the-art diagnostic equipment that will effectively identify the source of any allergic reactions, thanks to VetDERM Clinic. For parasites, fleas, and mites – year-round preventative treatments are recommended in order to prevent flea and parasite-related problems, and if present despite preventive care, prompt treatment to help resolve the issue is ideal. The treatment of allergies and dermatological problems are a part of the good cat care you can expect from your veterinarian, and you can learn more by visiting our veterinary allergy and dermatology clinic at: 3995 Hastings Street, Burnaby, BC, V5C 2H8 or call us at: 604-291-6666.